Prior to Stan coming to me he`d been turned away at grass for 18 months because nobody had got the time or the patience for him. Stan soon aquired his new stable "The Ginger Beast " and sadly where I had him stabled the daughter was moving on and her father didn't want any horses on the property so we had to search for new accomadation. Lucky for me just down the road was a big livery yard so I enquired there and soon we were moving to pastures new. 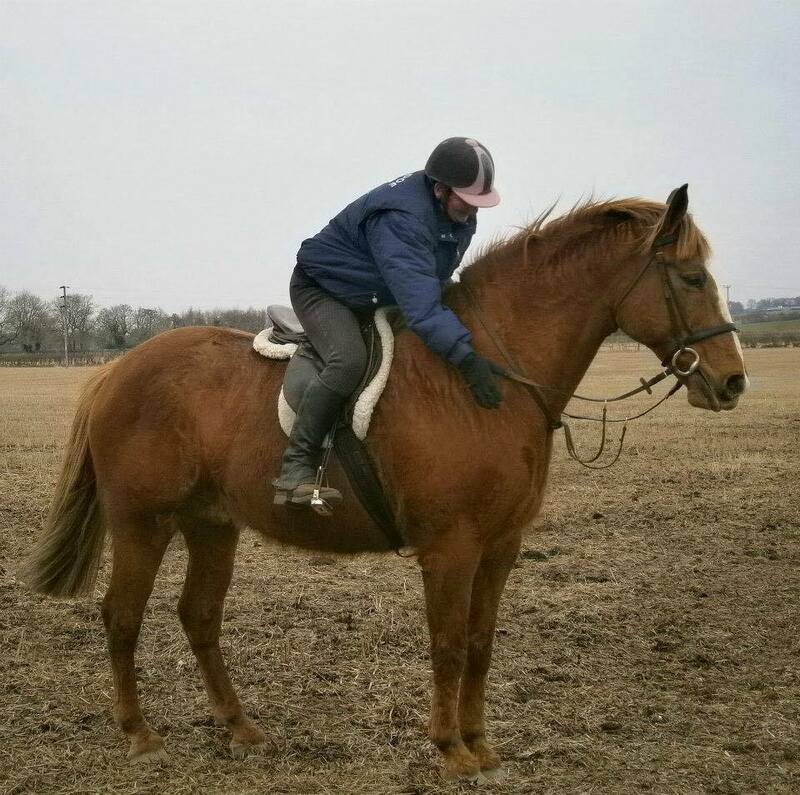 It wasn't until we moved here did I notice that Ginge had extreme seperation anxiety issues and in the stable we had been given which was to any normal horse perfect but to Ginge it was his worst nightmare. I returned back from a ride and left him in his stable with a cooler on ample hay, water and a quick snack for being good whilst I popped home to tend to my kennels. On my return I was faced with a frenzied pannicking horse. I`ve seen some stressed horses over the years but this was far worse than any I had ever seen. He was dripping from head to foot in sweat, it was dripping off his eyes even off his tail. He was trying to get over the back of the stable to where he could hear voices but because he couldn't see them it blew his head. There was no way he could stay in like this as he wasn't going to calm down no matter what I tried. So what to do...He couldn't go out dripping as he`d get pneumonia and you should never put a rug on a wet horse but it was past 6 o`clock and the air had changed so I had to do what I thought was best. So he went out with a dry cooler on and a lightweight rug on top. The next morning after a very sleepness night I was down the yard at the crack of light to make sure he was ok to be greeted at the gate with a whinny and much to my amazement a very happy un stressed horse. After this incident we were kindly given another stable where he could see all around him. It helped tremendously but then whenever anything was turned out he went mental . Not very helpful on a busy livery yard. We moved a stallion next to him which was stabled 24 / 7 except whislt being ridden so that was a massive help. He was turned out with a group of other geldings to which there was not a problem till he started herding them and not letting anyone near them. He acted very Rig like so we had him tested and thankfully he had the lowest form of hormones a horse could have so then he had to be moved to a field by himself, which was a bonus as I only had to poo pick after him not 6 others. He was placed at the bottom of the complex where he could see everything going on which was ok until the 3pm catch in took place then he`d do the wall of death till I got there at 5pm so you can imagine what he was like. So I invested in a Chifney, he certainly knew what that was. I was slowly but surely beginning to find out his little antics. It would have been about 6 months on that we started seeing The True Stan. He could flip himself inside out at the drop of a hat and when you least expected it. He hated the menage and he was adamant there were Goblins behind the fir trees at the bottom. Stan had been a Show Jumper and loved his jumping and his flatwork was next to none except he did insist on a walk to canter or as soon as you hit the outside track at a trot he immediatley went into canter mode. We occasionally used to have a clear round day for the liveries and with being one of the elder owners I had to show willing. He loved it ..No effort .. AND amazingly no goblins. A comment made by the manager of the yard which sums him up was "Look at that stupid horse, he`s just come to that combination watching the ducks on the pond ". This was him all over, always too busy watching what everyone else is doing.